Congratulations to giveaway winner, Sydney Bowers! Another quality giveaway right on the heels of LovePop Cards (ends tonight)... there must be a holiday coming up! 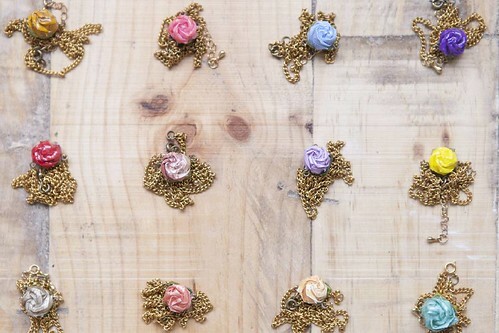 Raya Sader Bujana of Little Ray of Sunflower in Barcelona, Spain makes pretty paper jewelry. 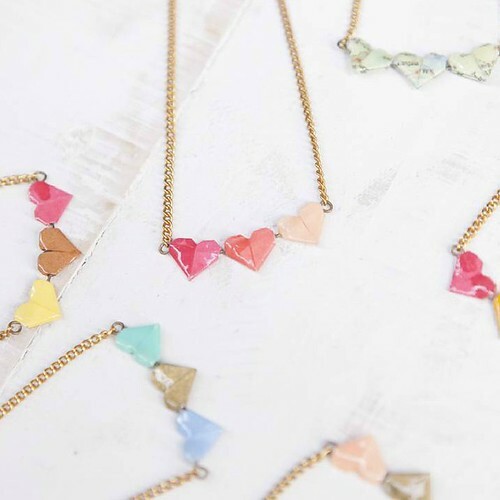 To spread the word about it and all of the handmade items in her shop, she is offering a worldwide giveaway... more about it at the end of the post, but first some details about these sweet heart necklaces. Each origami heart measures less than 3/8 inch (1 cm) and is protected by a glass-like finish. A trio hangs from chain that Raya reclaimed from a vintage chandelier. She often upcycles paper too. You might remember the popular Earth Necklace that was featured in her previous giveaway. 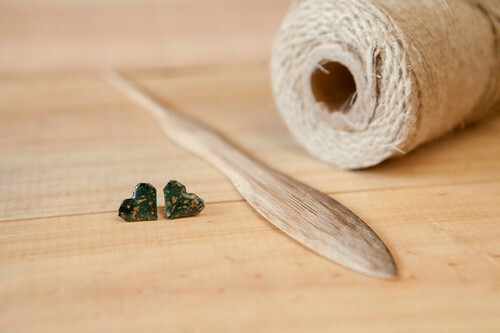 Raya makes origami earrings... for example, this pair of deep green heart studs with metallic gold flecks. 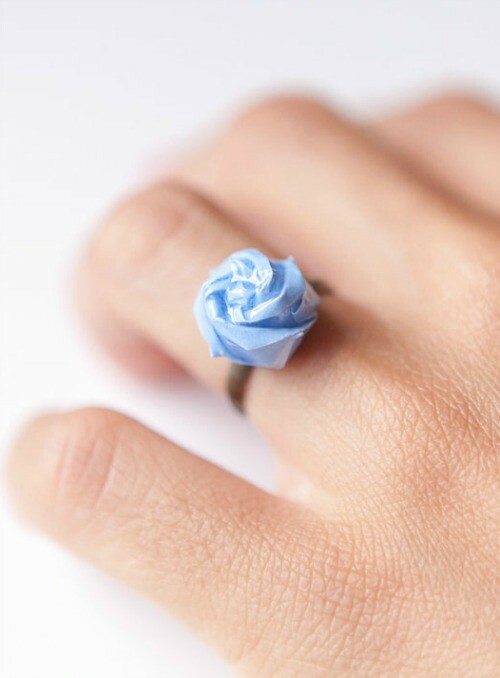 And folded rose necklaces and rings. 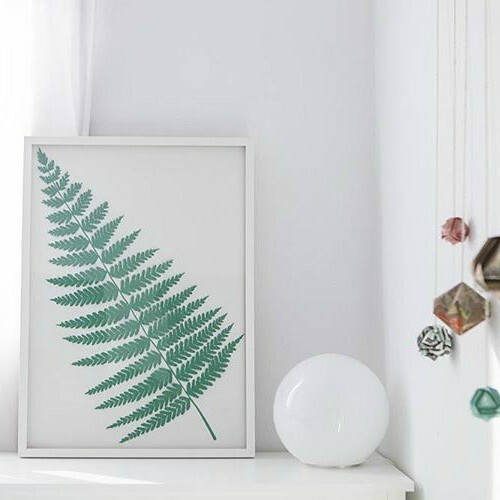 Party and home decor are specialties too, from origami cake toppers to garlands and mobiles, as well as this cut/sculpted paper fern. Now about the giveaway: Raya will be sending an Origami Heart Necklace to one winner worldwide. The winner will be able to choose from all of the heart necklaces currently available in the Little Ray of Sunflower shop OR any listed item of equal or lesser value. How nice is that! The giveaway will be a quick one... just through Thursday, January 28, 2016 in order for the prize to ideally reach the winner in time for Valentine's Day. To enter, leave a comment on this page. Be sure to include a way to be contacted within your comment. NEW: For those who would rather not visibly post an email address, comment here as usual and send me a quick message at ann.b.martin at gmail dot com so I will be able to contact you. If you are on Instagram, double your chances of winning by liking the giveaway photo and following @littlerayofsunflower and @allthingspaper. The winner will be drawn at random and announced at the top of this post and on the Instagram pic. Good luck! Visit Little Ray of Sunflower on Etsy, Facebook and Instagram where you'll see a variety of wonderful paper creations Raya makes for clients. Oh my goodness such tiny delicate art so lovely. Thank you for a chance to win. Her work is gorgeous!! I am a jewelry junkie and definitely need to look into her shop more! These are really unique pieces! 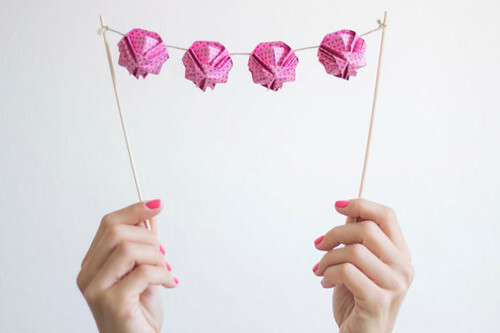 Loving the origami idea. I'd love to be entered. Thanks! Wow, this is beautiful! Thank you both for a lovely giveaway! OMG, I absolutely LOVE these beauties! Beautiful jewelry-what a great giveaway. Thank you. So wonderful... I think a tutorial is in need ;) Thanks for sharing. Beautiful. Love the satin finish to the paper. How absolutely enchanting! ... and I simply ADORE that little string of lanterns - how festive! Thanks for the opportunity to win such a generous prize! What stunning jewellery! Very unique, I've never seen anything quite like it before..
What a sweet giveaway, thank you. My favorite item is Bridal Hair Pins, Flower Bobby Pins, Flower Hair Clip, Bridal Hair Flower, Bridal Hair Accessories, Hair Flower, Wedding Hair Accesories. What a marvelous store! Thanks for the giveaway. Her artwork is the cutest thing ever! 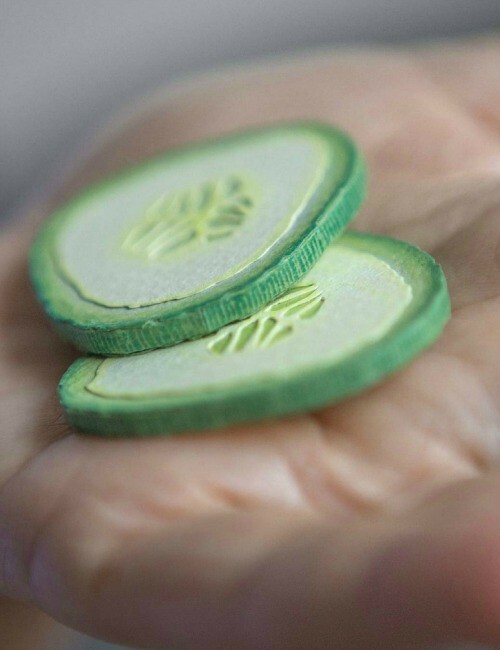 I've never seen a necklace pendant made out of paper! Hope I can win this :) Thank you for giving the chance to win! Beautiful creative work. thanks for the chance to win. So incredible! Just amazing that you can do all of that with paper. I'm a convert and going to try it out today! Thanks so much for the opportunity to win such a lovely piece of art. Awesome!! 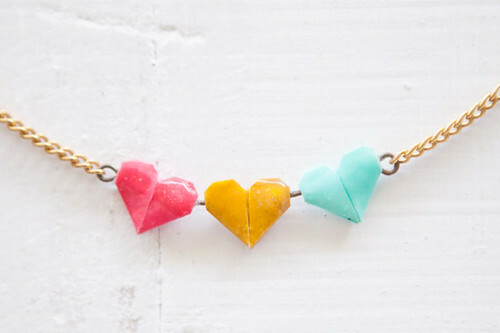 I love the hearts origami necklace! WOW! The heart pendant looks adorable!! That ring is the prettiest thing i have seen, ever! I love all of Raya's work. I checked her out on Etsy, Facebook and Instagram! So pretty! I love tiny art! n.serene[at]gmail[dot]com. Thanks for all of your enthusiasm and lovely comments, and stay tuned for upcoming giveaways!